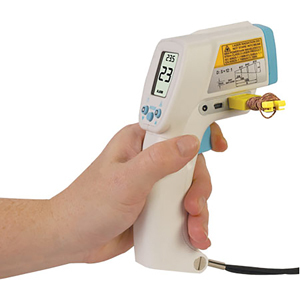 The high-performance, handheld OS1327D infrared thermometer is a non-contact temperature measurement instrument. The OS1327D features adjustable emissivity, laser sighting, backlit LCD, 12:1 field of view, max/min/avg/diff temperature monitoring, high/low audible alarms, temperature and data storage. 참고: Comes complete with a 9V battery, Type K thermocouple, USB cable, CD software and operator’s manual.